Stay warm and be seen with the Survive Outdoors Longer All Season Blanket. This multi-purpose thermal blanket's material is heat reflective and versatile, designed with direct weave technology that traps air for better heat retention and increases durability, meaning it won't shred like mylar blankets. Stay warm and be seen with the Survive Outdoors Longer All Season Blanket. This multi-purpose thermal blanket&apos;s material is heat reflective and versatile, designed with direct weave technology that traps air for better heat retention and increases durability, meaning it won&apos;t shred like mylar blankets. Strong enough to haul firewood and big game, the blanket has metal grommets with reinforced edges that can be used to rig an emergency shelter in survival situations. 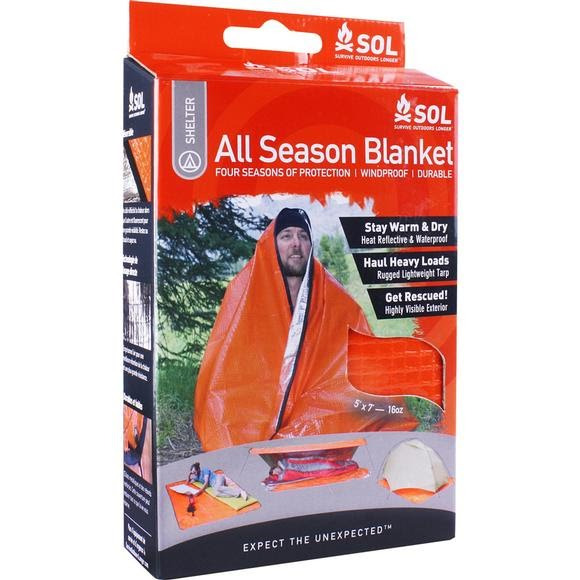 Compact and waterproof, the All Season Blanket is an essential addition to your survival gear to protect against the elements and keep you dry or to signal rescue teams with the bright orange color. Around the camp, use it as a tent tarp, gear cover for protection from the rain, or a lean-to shelter on weekend camping trips. With the benefits of an emergency blanket, camping tarp, and emergency shelter all in one, the All Season Blanket can be used again and again to help you stay prepared for whatever life throws at you.